Please use this guide to find the meaning for words listed on the site, or words you have heard that otherwise have a photographic context. If you would like to see descriptions for other terms, please feel free to let us know. Air brushing Traditionally this was the process of spraying a fine jet of dye onto areas of film or a print to change the appearance of an image. i.e. fix flaws in a models skin, or smooth out paintwork on a car. This process now takes place digitally within photo manipulation software, however it is still commonly referred to as air brushing. Ambient lighting Refers to the levels of light that already exist within a scene to be photographed, without the addition of any photographic lighting. Aperture A window of (usually) varying diameter at the front of a camera that lets in light. The aperture is typically found within the lenses of any camera. Changing the size of the aperture is one way of adjusting the exposure of an image. Inversely proportional with Shutter Speed when determining exposure. Aspect ratio The ratio between the height and width of an image. The most typical aspect ratio is 2:3 meaning that for every 2 units of height there are 3 units of width. This is the aspect ratio of 35mm format. Camera format Typically refers to the size of the film or digital chip used to capture the image, although there has been some carryover from film measurements. i.e. some digital cameras are described as 35mm format, even when they have a smaller chip size. Capture plane The point at which a photographic image is “captured”, either on digital chip, or to film. When referring to film it is typically called the “film plane”. Depth of Field The range of depth within an image that displays apparent sharpness. Extension tubes Tubes that connect between a lens and camera body to extend the distance between the back lens element and the image capture plane. Used for macro photography. Generation Each stage in the workflow of an image, where the information is tranferred to a different medium is classified as a generation. i.e. transferring from film to digital file by way of scanning, or printing from a file to hardcopy are each a generation step and are accompanied by a drop in quality. One of the benefits of digital capture is that it reduces the number of generation to final output. i.e. no scanning. Giclee A term commonly used in reference to high end art digital prints. Effectively a high quality inkjet (or similar process) print. Grey Card A card with a midtone, or 18% grey. Used to determine exposure readings with an in-camera light meter. In-camera light meters are calibrated to this midtone grey, meaning that whatever scene is being viewed, the camera assumes it will all average out to 18% grey. Hero When viewing a proof sheet or selection of images, the Hero image is the image selected for final use. i.e. typically the best image from the selection. Image Resolution Referred to in “ppi” (pixels-per-inch) or also “dpi” (dots-per-inch). Image resoltion is a measurement of pixel density in an image. For final output descriptions, a ppi or dpi figure has no meaning without a corresponding image size. i.e. a 4″x 6″ image at 300ppi is 1200 x 1800 pixels. An 8″x 12″ image at 150ppi is also 1200 x 1800 pixels. Both images have the same amount of information and will reproduce identically. 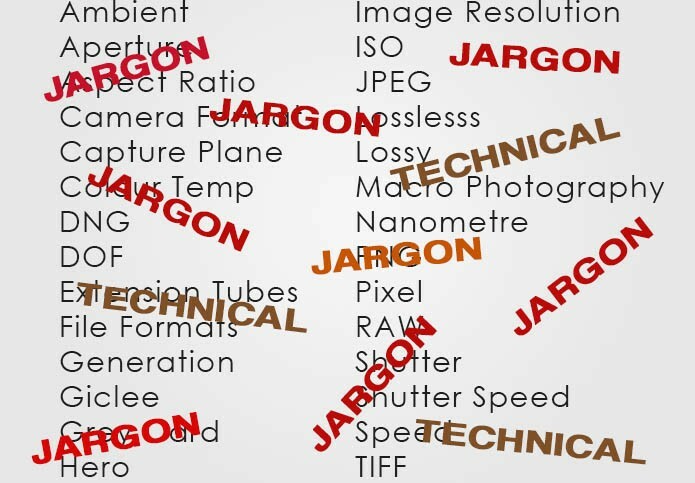 JPEG A commonly used file format. Please view our page on file formats for more information. Lossless Refers to a particular type of file format that does not disgard information upon saving, even when compressing to reduce file size. Please view our page on file formats for more information. Lossy Refers to a particular type of file format that disgards information upon saving in order to reduce file size. Please view our page on file formats for more information. Macro photography Photography where the size of the subject on the capture plane is similar or greater than the real size of the subject. Nanometre One billionth of a metre (or one millionth of a millimetre). Used to describe wavelengths of light (or anything else very very small). Pixel The smallest element of a digital image. Digital images are composed of many thousands or millions of pixels. RAW A commonly used file format for capturing images in high end cameras. Please view our page on file formats for more information. Shutter A window that opens to allow light to expose the image capture plane. Usually within the body of a camera, though with some formats, can be contained within the lense. Shutter speed The length of time that the shutter opens. Determines the amount of light that reaches the image capture plane. i.e. the longer the shutter is open, the more light that reaches the capture plane. Inversely proportional to aperture settings when determining exposure. Speed Refers to the sensitivity of film or digital chip to light. The higher the number the more sensitive, and therefore the less light required to make an accurate exposure. TIFF A commonly used file format. Please view our page on file formats for more information. TTL Or “Through the Lense”. Refers to a type of light-metering that occurs in-camera with light that has passed through the lense, thereby taking into consideration the characteristics of the lense and camera settings.